Purchase a kilt with up to 90days same as cash financing. Knowing that a kilt can be quite an investment,Tartan4U.com has instituted a new program to make such purchases easier.When ordering a custom made kilt package we will ask all pertinent size information and collect credit card details from you.The total purchase price then will be divided into three monthly payments with no interest added.Each month we will bill your credit card one payment with the first being billed upon ordering and the final payment being due upon shipmant of your kilt package.Delivery on custom made kilts from Scotland usually takes 6-12 weeks.These kilts are made to measure and are not returnable unless the fabric is found to be defective. 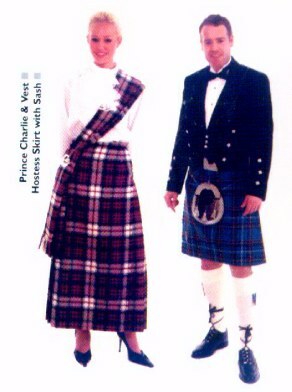 We now offer a great value on hand pleated kilts and kilt packages. All the kilts listed are constructed in all new worsted wool which provides great wear and holds its shape better then non-worsted fabrics. Kilts can be ordered pleated to "sett" or to "stripe" ( regimental fashion ). Please specify when ordering.Delivery may take up to eight weeks. We require four measurements when placing an order...1. Height , 2. Natural waist , 3. Hips ( at widest point ) and 4.Top of hip to floor. A kilt that goes to the middle of the knee will just touch the floor when in a kneeling position.The kilt maker will automatically add 2.25" above the hipbone to allow for a belt. 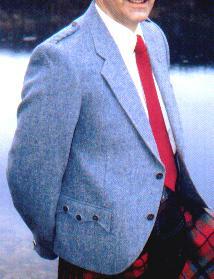 "Price Charlie" Jacket and Vest " Doune"
Shown above: Similar to Prince Charlie but more of a square cut and gauntlet cuff. 270-886-2010 or contact us by E-mail by using the form on the Contact Us page pf this site.